We begin this new British horror with a flashback, in monochrome, to forest clearing where a man is stirring a large, bubbling cauldron. He is surprised by several soldiers in what looks like Civil War-era uniforms (a nod to Witchfinder General, perhaps? ), the officer in charge grabbing him and accusing him of witchcraft; his dead daughter has been seen by several witnesses walking again after her burial. The cauldron, he claims is being used to create a potion which is fuelling her resurrection – the officer takes one of the soldier’s swords and cleaves the old cauldron in two, before ordering the accused man to be strung up from the nearest tree. We move to the present day, and Isabelle (Kate Goldfinch), a young museum curator, is called into her director’s office, where he explains that renovations in a remote, rural country house have turned up one half of the cauldron glimpsed in the prologue. The museum has had the other half for some years and is understandably keen to obtain the other segment for study – in fact Isabelle is surprised that her boss is asking her to head out to the house to verify the find instead of going herself, but of course she can’t say no. Arriving at the once-grand but now partly dilapidated country house she is met by Karl (Larry Rew), his wife Evelyn (Babette Barat) and their strange, pale daughter Scarlet (Florence Cady). She is welcomed in, given a room to stay in, invited to dinner, all the signs of hospitality are there and yet… Yet there is a distinct feeling right from the beginning that something is simply not right here – the family (especially Scarlet), there is something unsettling about them, and there is a feeling around the house that builds unease, a sensation heightened by first hearing someone walking around at night then later seeing Scarlet prowling the dark halls at night, even following her to the bathroom and at one point sneaking into Isabelle’s room (and rather strangely showing a keen interest in the other woman’s underwear), and there is the question of a strange music which haunts her. A visit to the local village pub builds this feeling of wrongness – a disgruntled younger man seems to be stalking her, warning her not to return to the estate or it will go badly for her. A threat? Or a warning? The family’s gardener (played by popular actor Neil Morrisey) seems friendly, although his story of the previous gardener (incidentally father to the angry young man following Isabelle) who was found with massive throat trauma and blood loss in the woods (passed off as a freak accident) again raises Isabelle’s concerns about staying in the house. Karl seems keen for her to finish her work and verify the find; she assumes he is just after money for the artefact, but Isabelle starts to wonder if there is another, secret motive. When she finds a hidden journal entry in the library in the house, detailing a former owner’s encounter with the cauldron fragment, and his subsequent series of nocturnal visitations, visions and what sounds very much like the same mysterious music she has heard herself. It seems this 19th century owner was trying to warn future occupants of the house, but what was he warning them against, and does it have anything to do with the cauldron she is investigating? This was a pleasure for me to watch, Iain Ross-McNamee has crafted a film which draws heavily on old-school British horror movies. Crucible draws on some classic Hammer inspiration – the creepy, old house surrounded by dark woods, the host who on the surface is welcoming but you just feel is hiding something. There are numerous other homages and references worked in here, notably a nod to Carmilla/The Vampire Lovers, and includes some nice phantasmagorical images and visions that, while this is very much a modern film, also gives it some of the airs of the 19th century Gothic novel. In a world where too many horror movies rely on sudden jump-scares or OTT gore, Crucible of the Vampire takes its time to build an increasing atmosphere of unease and a slow-burn of ever-increasing tension, laced with some beautiful cinematography and imagery, while upcoming young talent Goldfinch and Cady are especially good. 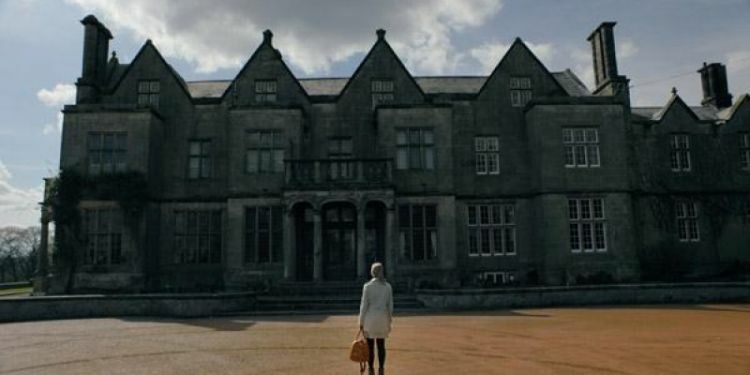 A modern horror that draws on classic, older Brit horror film traditions, while also mixing in a touch of ancient folklore and Celtic myth, there’s a lot to love here, especially for those of us still in love with Hammer.